The USBS-built inner vault truck allows for the speeding up of opening and closing procedures and assures that all cash trays have been removed at the close of business. The removable cash drawer (R.C.D.) systems offers an efficient and secure method of transferring cash between teller stations and the vault. R.C.D. trays are easily removed and locked securely into the R.C.D. bus without the need for lids or secondary locks. Model US205VT inner vault truck comes with 6 lockers, 2 large storage cupboards, doors are 1/8" thick, 5" casters: 2 fixed and 2 swivel. Dimensions: 40" H x 36" W x 19" D. Wt. 265 lbs. Choice of 9 finish colors. 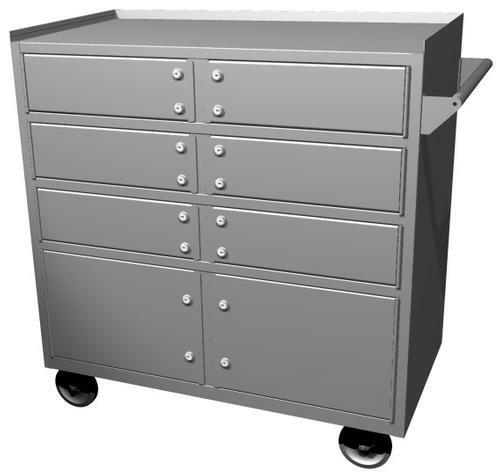 Inner vault truck comes with 6 lockers, 2 large storage cupboards, doors are 1/8" thick, 5" casters: 2 fixed and 2 swivel. Dimensions: 40" H x 36" W x 19" D. Wt. 265 lbs. Choice of 9 finish colors.